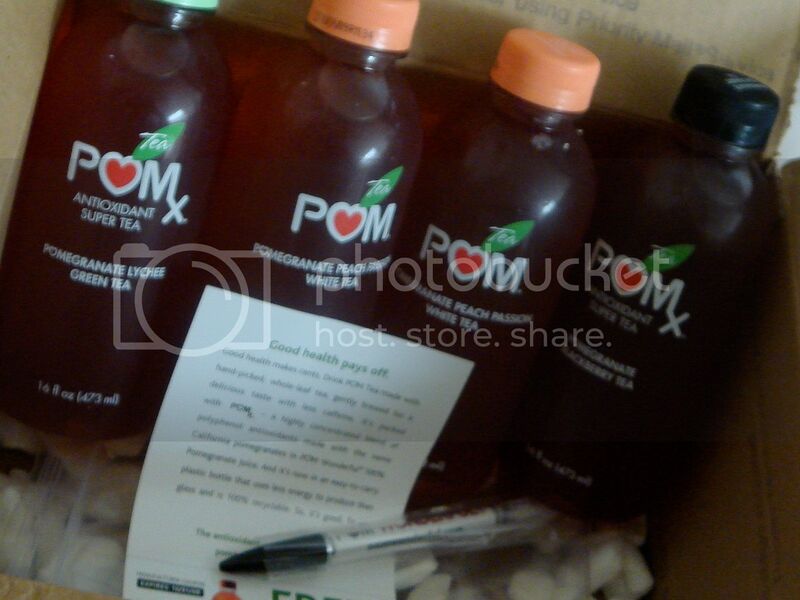 The wonderful world of POM Wonderful sent me a selection of flavors from their new line of beverages, Pom Tea. I will post more about it in detail later, but a quick overview: Featuring the antioxidant-rich 100% POM juice, you get even more of a flavor punch with the addition of black, green, or white tea and additional fruit juices. They also sent a pen, which I think is pretty dang neat (I love pens and pencils! ), plus a coupon for a free bottle of POM Tea. Score! Can't wait to get in the kitchen with those. Since I'm horrible, I still have a few bottles from the last case of POM Juice I was given. 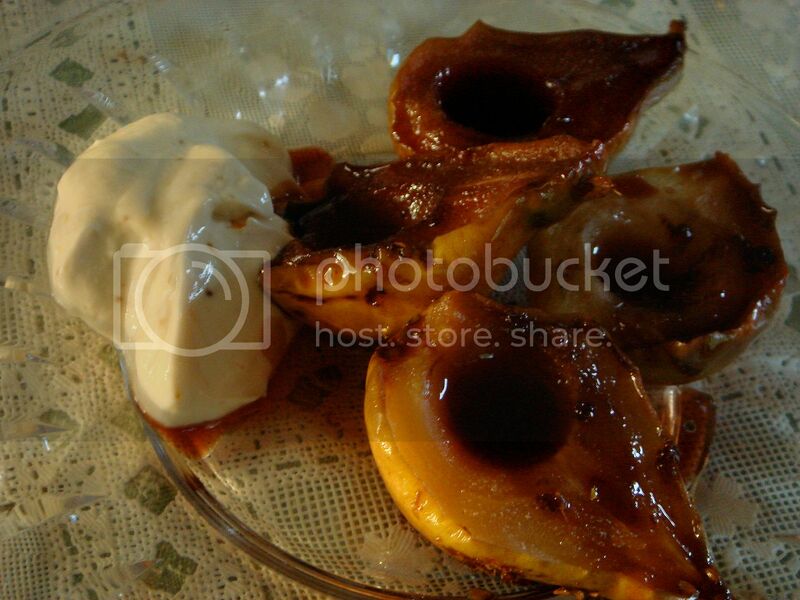 One was used up to make the syrup sauce for the caramelized pears. Whilst the original recipe only asked for water, I decided to sub it out with the POM juice. I also wanted to enhance the flavor by the way of a spice and eventually settled on aniseed and orange rind. My thinking lead me to believe that the tartness from the juice would pair well with the licorice tones of aniseed both would be brightened by the orange rind. I've made this recipe before, and I always make the same mistake of crowding the skillet when I go to caramelize the pears. This time I did this process in two batches, though the skillet was still crowded and should have gone repeated the process thrice. Because it's the charm. After you caramelize the pear, the lot goes back in the skillet with the POM, aniseed, and orange rind, covered and allowed to sort of poach until tender. Again, the heat is more evenly distributed when the skillet isn't crowded. Once you remove the fruit when desired level of tenderness is achieved, you raise the heat and let the syrup bubble if it needs to be reduced to a thicker consistency. I added the rest of the POM juice and a tablespoon or two of additional sugar. Fruit desserts like this are easy, can be made ahead of time and are light, especially when served after a heavy meal. The flavor is concentrated so you really don't need very much. I served the pairs with brown sugar-sweetened yogurt cheese to give it a little contrast and a bit of extra depth. Did the syrup taste as good as I expected? Yes. Just enough aniseed was added to lend it's flavor without being the overpowering taste, the orange rind brightened the dish, and the tartness was still there, albeit tempered by the sweetness. If you don't want the aniseeds, you could add anise extract at the end of the syrup cook-down process, starting with 1/4 teaspoon. 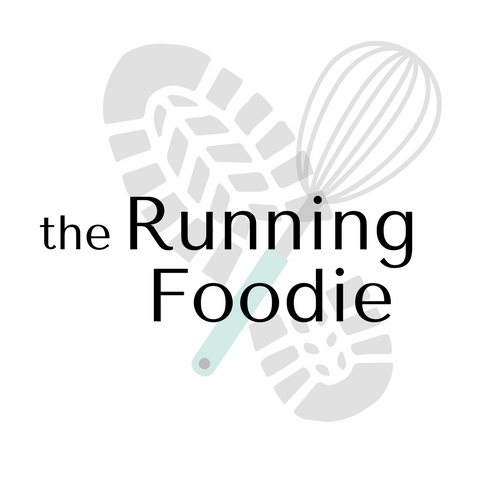 A little running update: I will be running a 15k (about 9 miles) tomorrow, Labor Day, so wish me luck! This is my first race over 6 miles and I'm looking forward to seeing how it goes. Race report to follow. Halve pears lengthwise; remove cores. (A melon baller removes cores easily, but a small spoon works, too.) Place sugar on a plate. Add 1/2 cup POM Juice, aniseed, and grated orange rind. 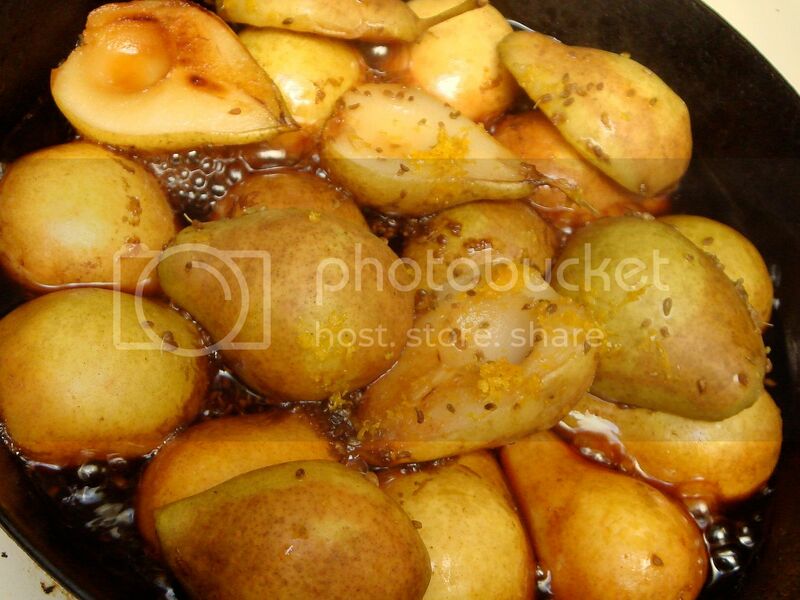 Cover; simmer until pears are tender, 5 to 10 minutes (depending on ripeness), adding more water if sugar begins to burn. 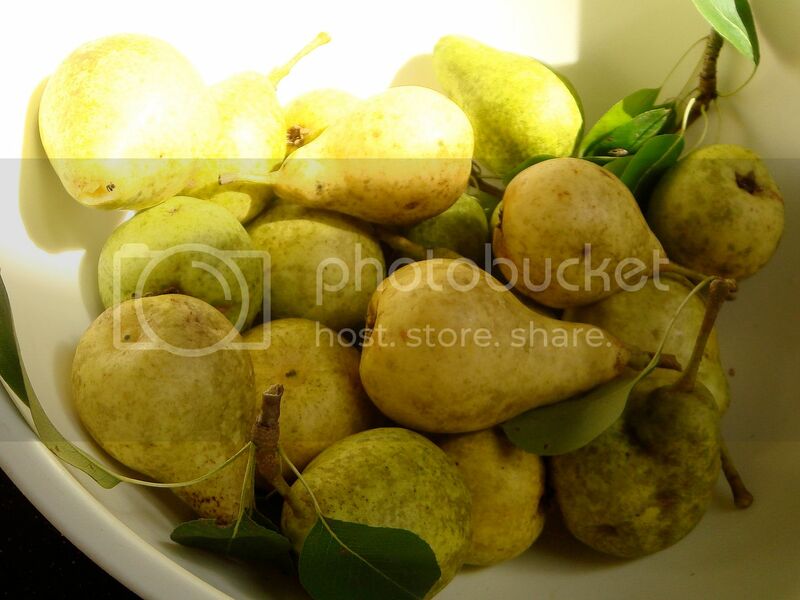 Remove pears to a plate or bowl. Add remaining 1/2 cup POM Juice and two tablespoons of sugar. Turn up heat to medium-high and allow sauce to reduce until a syrupy consistency is reached. Serve sauce over pears. Serve with 1 cup yogurt cheese sweetened with 2-3 tablespoons brown sugar, divided amongst each plate, or sour cream or creme fraiche. Good luck with the 15K!! Do you have a pear tree in your yard? If you do, I'm incredibly jealous. This sounds like a brilliant recipe. Those POM people are so nice. 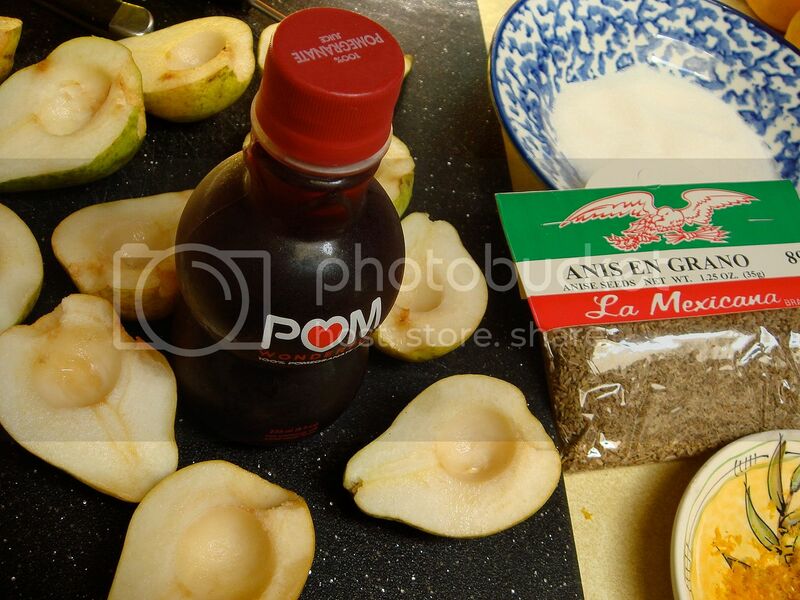 The pears look incredible, I love the idea of the POM syrup. Good luck with the race! I'm so bad, they sent me a product sample and totally haven't reviewed them! Oh well, perhaps when I come back...i'm so excited! VeggieGirl ~ Yes, these definitely were! Em ~ POM people are amazing, no doubt about that. Sam ~ It's delicious on pancakes and stuff, too. Gluster ~ Dude, it took me forever to use them because I couldn't think of anything good enough and I didn't want to just guzzle them down! We [url=http://www.onlinebaccarat.gd]craps online[/url] be suffering with a large library of utterly freed casino games in regard to you to play right here in your browser. Whether you appetite to procedure a provisions encounter plan or scarcely examine out a occasional late slots in the presence of playing on the side of unfeigned in clover, we have you covered. These are the exacting verbatim at the same time games that you can engage at true online casinos and you can play them all quest of free. Clif Bar and Quench Giveaway!